Injury Report: The Raptors have listed Delon Wright as questionable with a left adductor strain. The Cavaliers injury report is still to be decided. Down to business: After more than five months, the Toronto Raptors will take the court for a (non-preseason) NBA game on Wednesday night at Scotiabank Arena. With nearly a month of training camp, scrimmages and five preseason games completed, when the ball goes up against the Cleveland Cavaliers, the 2018-19 NBA season officially begins in Toronto. This will be the 24th season for the Raptors, who finished with a 4-1 record during the preseason. It will also be the ninth time in the previous 10 seasons that the team has opened the season on their home floor. Toronto is 5-0 in season openers over the last five seasons (2013-17). Fresh Faces: Though the Raptors will open the season against the Cleveland Cavaliers, both teams look markedly different than last season’s Eastern Conference Semifinals matchup. Tomorrow will be the regular season debut for Kawhi Leonard after being traded to Toronto, along with Danny Green, from San Antonio in July. It will also kick off Nick Nurse’s first season as head coach of the Raptors. For the Cavaliers, this will the beginning of a new chapter following LeBron James’ exit for Los Angeles after signing with the Lakers in the offseason. This will be the third time in franchise history that the Raptors have started the season against the Cavs, winning 104-96 in 2011 and 101-91 in 2009. Expectations abound: After the team’s third consecutive 50-win season last year and a franchise-record 59 victories that gave Toronto the top seed in the Eastern Conference, there’s plenty of buzz about what this year’s Raptors squad will do. For head coach Nick Nurse, outside expectations are always going to be present. “You’ve got to embrace that stuff,” Nurse said. “I embrace it, [and I] certainly like it this way [with high expectations, rather] than the alternative." Though there will be speculation and predictions about how the team will fare this season, Nurse's focus is on ensuring the team starts the regular season playing the right way. Since becoming head coach, he has talked about wanting his team to play aggressively on both ends of the floor. After Tuesday's practice, he shared that the team has spent 85 percent of the previous 10 days keying in on defence. 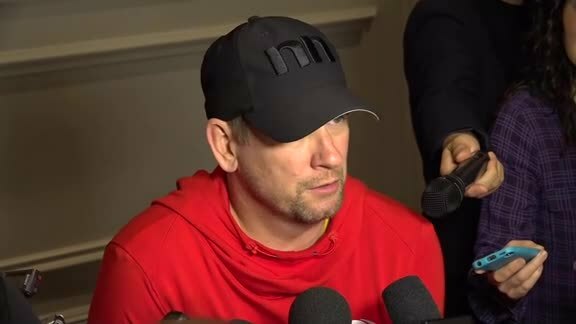 "I think your practice structure, your preparation, all those things feed into that sense of we’re ready to play and we’re ready to fight," he said.